Does a sonic boom occur the entire time the aircraft is flying supersonic, or just at the point where they accelerate past the speed of sound? My understanding was you only get the boom when the aircraft passes into supersonic speed, because as they're coming up on the sound barrier, the waves are building up at the tip of the nose, such that as that wave expands outward, anything it passes experiences a big "wave" of all the built-up sound. But once the aircraft is flying faster than sound, wouldn't the sound waves simply go back to being normal waves? They'd be "tripping" over each other, but they wouldn't be amplifying each other harmonically anymore, causing a sonic boom, would they? It is my understanding that the "sonic boom" occurs continually, but it of course moves along with the flightpath of the aircraft (it travels along with the plane so you normally only hear it once as it passes near you, putting you in what they call the "boom carpet"). I want to avoid a sonic boom because I don't want windows to break. So maybe just under the speed of sound? It occurs continually, and, different parts of the aircraft can generate a sonic boom before the entire ac 'breaks the sound barrier'. Al, windows will not necessarily break depending on altitude, size and speed. Another incident, an F-105 on a fly-by at the AF Academy below the speed of sound, that's his story and he's sticking to it, broke windows in the chapel. As I said, the F-4, at about 40,000 lbs, did not break any windows. However, it was an attention getter. Neither did the 105 at about 45,000 lbs. The 111, at about 65,000 lbs did the job quite nicely. To "picture" a sonic boom (but in two dimensions) sit by a fairly calm lake front and watch a power boat go by. When its wake hits the shore, that is your equivalent of a "sonic boom" (but a different fluid - water instead of air). Naturally, the point where the wake hits the shore "moves". Same with a sonic boom. There is one continuous "boom" but perceived only where it strikes. Most sonic booms I recall from years ago had "multiple" components (sort of a ba-Boom!) effect. I assume this was due to the multiple areas of the aircraft creating separate shock waves. Here's another question: considering an advanced fighter like an F15. The plane carries no ordnance. Would there be anywhere that you could stow a folding bicycle or a small electric bike? For example, in a bomb bay?? Not real familiar with the F-15, but they do have a travel pod. Not sure you could get a bike or scooter in there. 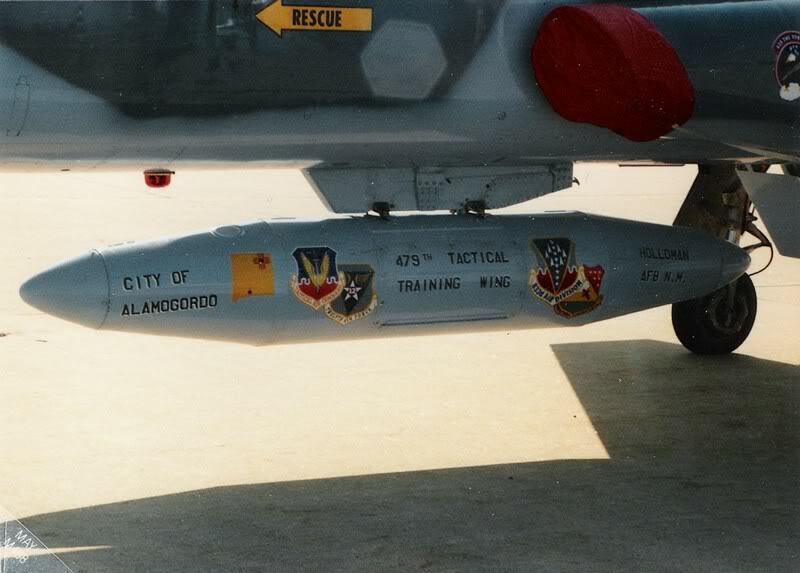 The F-111, still active in the Australian AF does have a weapons bay big enough, and it also has the range and speed you might be looking for. The could be deployed to Red Flag and thats why they are in country. Next question: If all satellites and ground stations are out, and the plane is traveling from Edwards Air Force Base to Washington, DC, when might it lose radio contact with Edwards? Air Force proof once again, you can make a barn fly if you hang a big enough engine on it. Admittedly thes barns, and the C5 are pretty awesome barns. It would depend on the radio and the altitude of the aircraft. I would say at least a couple hundred miles. If the A/C has an HF radio, then the range is unlimited, but not always depending on atmospheric conditions. I have listened to the states in Vietnam on HF. However, I know of no fighter that has HF. Another plug for the f-111 is it has the range to go from Edwards to DC without refueling. We flew from Shaw AFB, SC to Mountain Home Idaho and had about an hour and a half of fuel left, and that was against the wind. You should expect a tail wind going east. and heights are measured in feet. 1.23 ((10)+(224)) = 290 NM (or 330 statute miles). Mountain ranges that stick up higher than the assumed earth curvature would decrease the range somewhat. Another aircraft up in the air serving as a relay (effectively, another 50,000 foot antenna mast) could extend the line-of-sight a lot, so that the range would then probably be limited by the power and sensitivity of the transmitter/receiver respectively, not by the line-of-sight issues. While most modern fighters are capable of flying at 50,000 ft, most don't, and few would.cruise at that. Above 50 you are required to have a partial pressure suit, and I don't think pilots are fitted for them other than maybe U2 or SR71. Example, once more the 111, we flew most cross countries around 25,000 ft. Because of the wing sweep that is where it was most economical. While most modern fighters are capable of flying at 50,000 ft, most don't, and few would.cruise at that. Right, I was using 50K' as a wag for an altitude to which you might climb for a brief radio chat before resuming cruise. I know turbo>jet< engines get more economical at high altitudes, but I'm less certain about the "MPG" issue for modern turbo>fans<. Don't want to mess up your creative process here, but if the massive EMP takes out all the radios, won't it also take out all the modern avionics. Some older planes used hydraulics and less electronics, but even they had wiring harnesses. Wouldn't the planes fall out of the sky with no control systems and no cockpit instruments? T-Al previously mentioned something about California/parts of the West coast not getting hit by the EMP. NORAD - deep in the bowels under the mountain, the military had a handful of planes hidden 'just in case' of a nuclear strike that took out most of the fleet. Area 51 - they have to keep those reworked UFOs planes hidden within secret chambers deep underground to keep those top secret prototypes a secret. Thanks, I must have missed that part. Aren't EMP events basically line of sight anyway. Which is why air bursts are more devastating because they are visible from larger viewing area. OK, looking good (I want them to be out of contact). The scenario is that they fly this prototype, which was about to fly from Edwards to Pensacola anyway, to DC. They take along this old 90-yr-old guy (Salty) because he can use a sextant, and has done a lot of no-instrument flying over DC. A lot of aerobatic flying as well. A. The spaceplane momentarily loses all control and goes into a _______________ (flat spin, flameout, tailspin, tumble, something else). The pilot wants to give up and eject, but Salty tells him to _______________ (full throttle, left rudder, blah blah) based on his biplane aerobatics experience. B. The spaceplane momentarily loses all control and goes into a _______________ (flat spin, flameout, tailspin, tumble, something else). The pilot wants to give up and eject, but Salty calmly talks him through a maneuver that will recover control of the plane. Here is a real life airplane sextant story. Many planes will not go into a flat spin. That's a great story, thanks. I will probably include a quick summary of that in my book as part of the justification of sending a sextant navigator in the plane. So, in 1947 they still used sextants for navigating for transatlantic flights? It makes sense, but I never considered that. Does that mean that all transatlantic aircraft included astrodomes? Not normally used today but the location of stars and map of the earth is not effected by any war and can not be jammed.